Group Accounts are a great way to organize Operate Accounts that belong to the same customer, who rents space in different locations that you manage. A Group Account represents one main customer account group to which sub- accounts of the same customer can be assigned. This feature is useful when you manage each of your locations under a different legal entity and the accounts that you want to group belong to the same client company, renting space in different buildings. In such a case, you would need to create multiple account for the same company, under each of your legal entities, then create one Group Account that includes both/all of those belonging to the same client. All Accounts included under a Group Account will have the same Portal Login Credentials and the admin level contacts will be able to use their portal login on behalf of all accounts included within the group. Portal admins will therefore be able to pay invoices and view account statements. Go to Member > Group Accounts. Your group is now created and ready to have accounts assigned to it. If you want your Group Account record to include more than the name, you can customize the page layout and add further fields - either standard or custom. If the Account record has not yet been created, you can simply access the Group Account from under the Member > Group Accounts section, scroll down to the list of Accounts and click New. This allows you to create it from scratch, using the regular Account creation process. 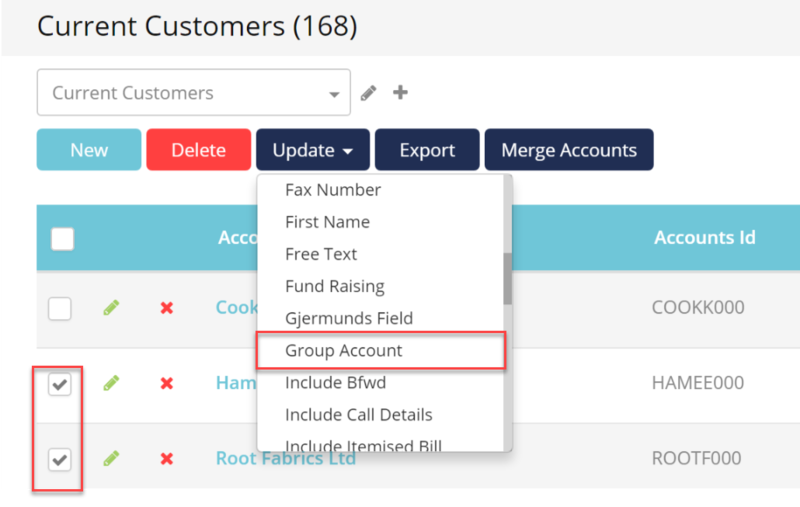 You can also create it from under Member > Accounts and select the Group Account while adding the customer to your system. When your customer's account has already been created, you can create the group, then go to Member > Accounts and find your customer. Edit the Account record using the pencil next to it, then under the At a Glance section, simply select the Group Account within which you want to include it. You can update the same field by going to Member > Accounts then selecting the Account(s) you want to include in a specific Group Account. With your Account(s) selected, click Update > Group Account.